Super sharp blades. Definitely worth the small extra price compared to standard LB blades. Very good price. Very sharp edge. Great value in a 50 pack. Amazing blades, very sharp. Made in Japan. 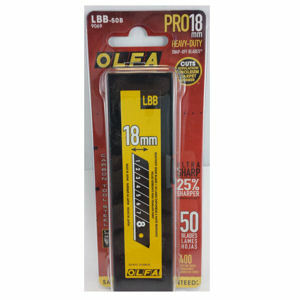 Olfa UltraMax Heavy Duty Blades, LBB-50B, 50 Blades/pk. 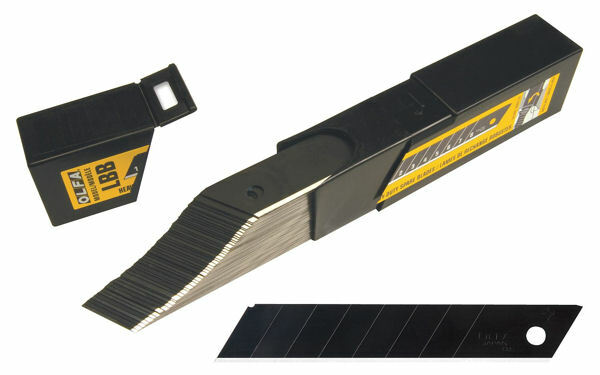 These UltraMax ultra-sharp premium heavy-duty snap-off black blades, exclusively designed for maximum cutting performance, are ideal for applications where superior sharpness is required. 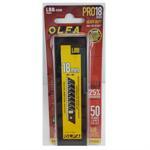 Long lasting durable snap-off blade is 25% sharper than the Olfa Heavy Duty LB Blades. 50 Blades per pack. Good for cutting drywall, roofing, leather, rubber, etc..